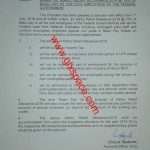 Government of the Pakistan Finance Department Regulation Wing Islamabad has issued Notification No. F.No. 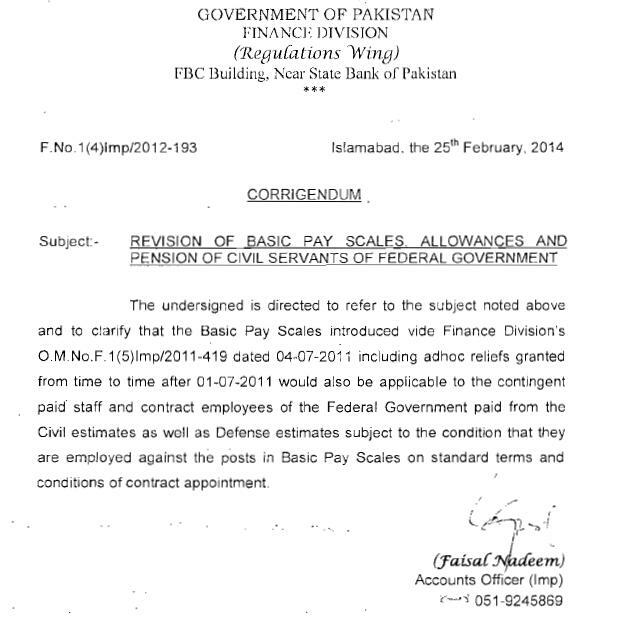 1(4) Imp/2012-193 dated 25th February 2014 in connection with the Basic Pay Scales 2011 & Adhoc Allowances to the Contingent Paid Staff and Contract Employees. 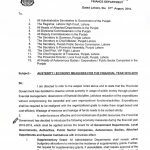 According to this Notification the Basic Pay Scales 2011 introduced vide Finance Div Notification No. F.1 (5)/Imp/2011-419 dated 04-07-2011 and the Adhoc Relieves granted from time to time after 01-07-2011 would also be applicable to the Contingent Paid Staff and Contract Employees of the Federal Government paid from the Civil Estimates as well as Defence Estimates subject to the condition that they are employed against the posts in Basic Pay Scales on standard terms & conditions. 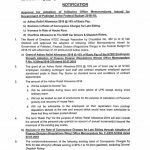 Asalam Alakum, Shumaila Kamal i am serving as Deputy Director Finance in Housing Foundation, kindly tell my that whether the contingent employees are entitle for all previous adhocs like employed in 2016 and can get adh0c 2010.
a.salam u alaikum... Mam i m recently appointed on BPS-17 in University of Gujrat, (Punjab goverment)regular contract periode of 2 year. would u like to tell me wht will be the basic pay and allownces i will get...? what is the mean of contingent paid employee. Is it daily wages ? Kya contract period ki increment fed govt employee ko mil sakti hy. un ki job permanent hony per. Dear Imran agar contract period bhi regular ho jai to un ko increment bhi mil jai gi. Main fed govt. 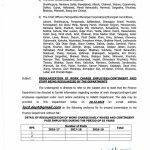 main clerk ki job krta hon. pehly main contract pay tha but meri phir appointment permanent ho gai. or meri increment contract wali cut kr di gae.jo k ab mujay nahi milti. kya contract wali increment mujay mil sakti hy. 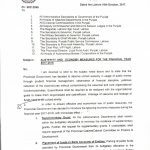 main provincial employee say suna hy k un ki contract wali increment un ki personal pay main add kr di jati hy. agr is k mutaliq koi informaiton hy tu please mujay bata dain. Can you explain please , what is the difference between contract and Hon. Paid Staff and why standard employment rules not apply on Hon Paid Staff. Dear Mehmood Contract Employees are those who are getting pay and allowances according to the Govt Pay scales while the Honorary Paid Employees are those who get the pay from Funds. Please tell if the same will also apply on the Hon. Paid Teaching Non Teaching Staff in FGEI, Please. Thanks madam for ur reply. Dear madam ab iski detail b bata dein k yeah kia hai? Nahein samjh aye ? 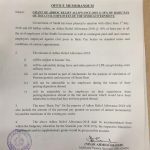 pls bata den k yeh jo basicpay men adhoc allwnces shamil kar diyeh gaey hen yeh sirf fedral wale sarey malazmeen k lieyeh hay ya provincial malazmeen k lieay b pls is ki tafseel bata den mujay notification k samaj nahin aey.